We believe an enterprise database solution requires technology, tools and services, and that it should be easy to buy, easy to deploy and easy to manage – providing a great customer and user experience from beginning to end. In fact, we’ve made ease of use a central theme in our roadmap, and with the introduction of MariaDB TX today, we’re taking another first step – packaging MariaDB technology, tools and services into a unified offering to help customers succeed with MariaDB infrastructure: MariaDB Server, MariaDB MaxScale and MariaDB Cluster. In addition to introducing MariaDB TX, we are releasing MariaDB Server 10.2 and MariaDB MaxScale 2.1. 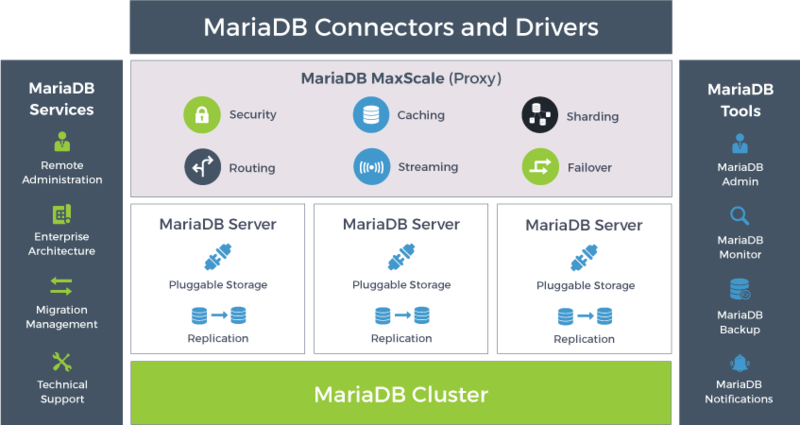 MariaDB Server, MariaDB MaxScale and MariaDB Cluster (Galera Cluster for MariaDB), along with MariaDB connectors and drivers, form the base technology in MariaDB TX. By bringing them together, we are building a modular, integrated platform rather than separate, independent products – making them easier to deploy, easier to use and easier to manage … together. In addition, MariaDB TX includes tools for administration (SQLyog for MariaDB), monitoring (Monyog for MariaDB) and backup/restore (MariaDB Backup) as well as notification services (e.g., security alerts). In addition, we’re creating and investing in more innovative tools for future release, including MariaDB Replication Manager (MRM). And finally, to ensure customer success and satisfaction with MariaDB TX, we provide expert services for everything from database administration to enterprise architecture to migration management. In addition to technical support, customers can choose to extend their team with a remote DBA, a dedicated enterprise architect or migration project manager – resources with expert knowledge and experience. A great way to learn more about MariaDB TX 2.0, including the new features in MariaDB Server 10.2 and MariaDB MaxScale 2.1, is to join our upcoming launch webinar. If you want to dive right in, keep reading! With MariaDB Server 10.2 and MaxScale 2.1, MariaDB TX 2.0 raises the completeness, compatibility, performance, scalability, security and disaster recovery of MariaDB – setting a new standard for open source database solutions in the enterprise. First, we wanted to increase SQL completeness and schema compatibility. If you choose MariaDB TX over Oracle Database or Microsoft SQL Server, you should be able to perform similar queries on similar schemas. And while many of these features have long been available in proprietary databases, we’re excited to make them available in an open source database. Next, we wanted to increase performance and scalability, focusing on storage, replication, querying and routing. At scale, improving storage efficiency and reducing disk IO not only improves performance, it reduces costs. Today, that means optimizing for SSDs, which is why we’re introducing MyRocks, a storage engine developed by Facebook for web-scale use cases. Finally, we wanted to increase security and disaster recovery. In particular, by expanding the capabilities of the database firewall by ensuring sensitive data was protected, prepared statements were examined and denial of service queries were prevented. For disaster recovery, we introduce point-in-time rollback a la Oracle Flashback.